I don’t know who is going to win the Premier League this season. Manchester City should be slight favorites over Liverpool because of their better record and superior depth, but the margins separating the two clubs are so minute that it’s impossible to feel strongly one way or the other. What does seem clear about the title race, though, is that whoever eventually lifts the trophy come May 12 will be a team that has actively won the thing, as it looks like both City and especially Liverpool are too strong and determined to hand the title over to the other by tripping over themselves. 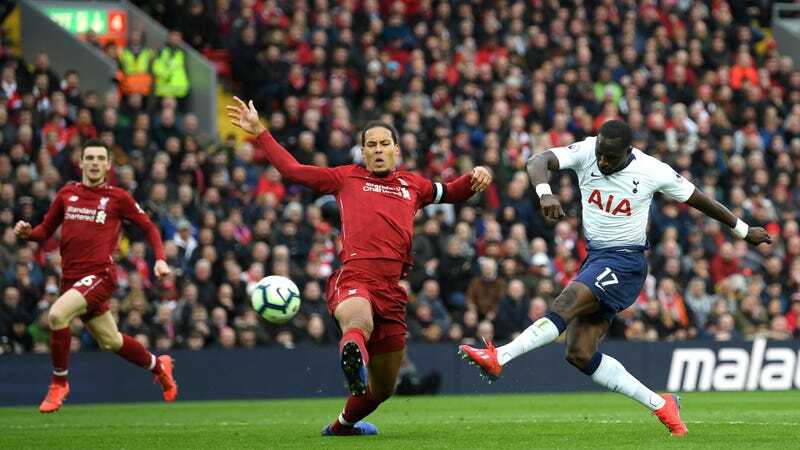 Sunday’s match between Liverpool and Tottenham was one of the best examples yet that the Reds, through some combination of good fortune and sheer cussedness, are too focused to gag away the title the way they did in 2014 with the infamous Steven Gerrard slip. The Spurs match was probably the biggest banana peel left on Liverpool’s schedule. Tottenham are the best team Liverpool will face in the run-in, and though the match was a home one for the Reds and came during Tottenham’s worst stretch of form this season, the game still had all the makings of a dogfight. Liverpool got the opening goal just 16 minutes into the proceedings with a header from Roberto Firmino, but Spurs never let them relax with the lead. Tottenham tried to claw their way back into the game from that moment on, and eventually they did score a well-deserved equalizer in the 70th minute. That was the point it looked like things would go sideways for Liverpool. A draw wouldn’t have been Liverpool’s death knell—though it would’ve essentially handed City a three point lead effectively worth three-and-a-half points because of City’s sizable goal difference advantage—but the toll’s tone would’ve been mighty funereal. All of the sudden the club’s grip on the trophy would’ve gone from tightening to slipping away, the thrill of a potential title win giving way to pure anxiety about losing it. A draw or a loss to Tottenham would’ve become the moment everyone pointed to as this year’s equivalent to the Gerrard slip. There’s so much in van Dijk’s one-man stand that demonstrates how utterly amazing he is as a player and how key his presence has been to what could be a multi-trophy-winning year. The athleticism to keep up with the counter, the instincts and genius to know precisely where to stand to close off Sissoko’s passing angle while simultaneously forcing Sissoko off his strong foot should he try to go for it himself, the patience and serenity not to panic and go lunging for the tackle that likely would’ve ruined it all, the intelligence and dedication to learn his opponents’ strengths and weaknesses beforehand (VvD, on his thought process during the play: “I see Sissoko and I know he’s right footed, and Son normally finishes these chances, so yeah, I decide from that.”)—all of it was a masterclass in defending. The Dutchman’s defensive ability, and the way he’s imparted it along with his composure to the team as a whole, is one of the major reasons why Liverpool have put together one of the best league campaigns in the history of the competition, and is why Liverpool appear likely to close out the season without a calamity on par with Gerrard’s gaffe five years ago. Yesterday’s match would eventually see a goal scored thanks to an inexplicable error by an otherwise good player, but it was Tottenham’s Hugo Lloris’s blunder that determined the match rather than any Liverpudlian’s. Facing a tame headed shot from Mohamad Salah in the final minute of regulation, Lloris could only redirect the effort straight into his teammate Toby Alderweireld’s path. Lloris should’ve either caught the shot or slapped it out somewhere safer, but instead the ball dinked off Alderweireld’s legs and rolled over the goal line to give Liverpool the crucial lead. And it’s wins like that, and stops like van Dijk’s, and goals like Divock Origi’s against Everton, and game-changing interventions from the bench like Xherdan Shaqiri’s, and countless other big and small moments throughout the long season that prove that Liverpool are dead serious about doing everything in their power to be the ones lifting the Premier League trophy at the end of the season. City might still win it, but to do so, they’re going to have to take it.